Repaving a parking lot isn’t generally something we’d get too excited about here at the Forest Products Laboratory (FPL). That is, unless the project incorporates wood, in which case, we’re totally stoked. And that’s exactly what happened in Greenville, South Carolina, at the headquarters for the U.S. Endowment for Forestry and Communities (Endowment). A parking lot there has become the largest test site in the world for cellulose nanomaterial (CN)-enhanced concrete, which FPL researchers and partners at the Endowment, Oregon State University, and Purdue University have found to have improved properties over traditional concrete. Civil and Structural Engineer (CSE) Magazine recently published an article about an exciting advancement in the practical application of cellulose nanomaterials – using nanocellulose as an additive to concrete. Purdue University researchers, who have been long-time partners of the Forest Products Laboratory, have been studying whether concrete is made stronger by infusing it with microscopic-sized nanocrystals from wood. Their research is now moving from the laboratory to the real world with a bridge that will be built in California this spring. “Simply getting out there where people can actually drive on it, I think, is a huge step because you can’t just say it’s a lab curiosity at that point. 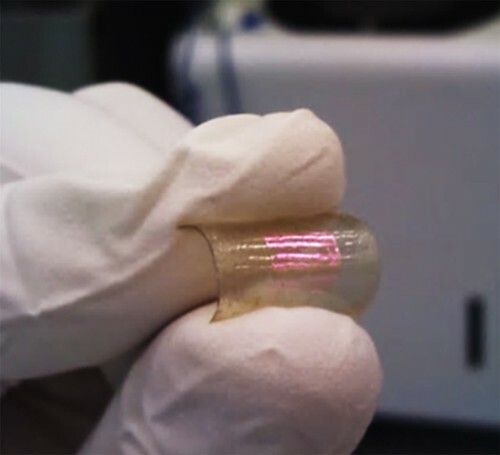 It has real-world implications,” said Jeffrey Youngblood, a Purdue professor of materials engineering. Read the full article here to find out how minuscule wood particles can make concrete stronger, and the many added benefits researchers are discovering through this project. The following is a post on the USDA blog highlighting research from the Forest Products Laboratory and the Northern Research Station. The original post can be seen here. Some people are just way ahead of their time. In the mid-20th century, when most people thought of wood as an archaic and low-tech material, Egon Glesinger foresaw the revolutionary role it would play in our future, described in his book The Coming Age of Wood. Scientists in the Northern Research Station’s new Strategic Foresight Group developed a horizon scanning system to identify emerging issues and trends that could be game-changers. A theme that has emerged is the wave of amazing innovations in wood products that could prove Mr. Glesinger right. For example, wood-based nanomaterials have been produced at the Forest Products Lab (FPL) for more than five years. This renewable, biodegradable material can be used to make computer chips, flexible computer displays, car panels, replacement tendons – for humans – and coatings that keep food fresh longer. 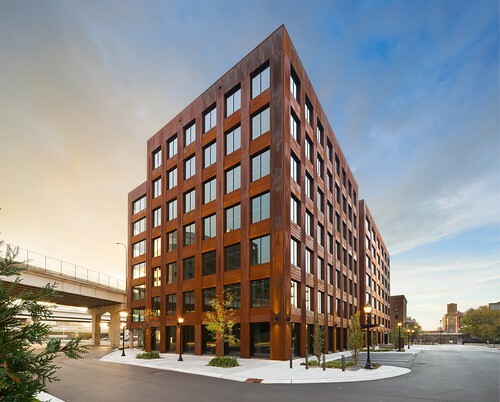 Tall wood buildings, or plyscrapers, are sprouting up across the globe today, built with cross-laminated timber (CLT) and based on research from the FPL and elsewhere. CLT is made from layers of wood crisscrossed and held together by fire-resistant glue. It is as strong as structural steel, greatly speeds up construction, and has a much lower carbon footprint than steel and concrete buildings. Power-generating wood flooring is being tested at the University of Wisconsin-Madison, a collaboration between the University’s College of Engineering and the FPL. Made mostly from recycled wood pulp, the flooring is chemically treated to produce an electrostatic charge as people walk across it. The charge can power lights and smart building sensor networks, and charge batteries. The list of high-tech innovations in wood products goes on. Cellulose from wood pulp could be cheaper and stronger than petroleum-based polymers currently used for 3-D printing . Fabric made from wood fibers could revolutionize both the textile and forest industry. Wood nails can be driven into solid structural timber without drilling pilot holes. A new process chemically removes lignin from natural wood fibers to produce a transparent wood substitute for glass windows and solar cells. And biodegradable electronics could someday help curb the problem of e-waste. These and many other marvels of wood product innovation could make the 21st century the century of wood , increasing demand for wood, leading to increased tree planting to meet demand, and the development of markets for wood currently lacking market value. Importantly, thinning overgrown forests with high fuel loads to supply these markets may also decrease wildfire risk. The University of Wisconsin released the following article by Will Cushman about the advancement of a project the Forest Products Laboratory has been a collaborator on. Read on to see how simply walking on a wood floor can generate electricity! 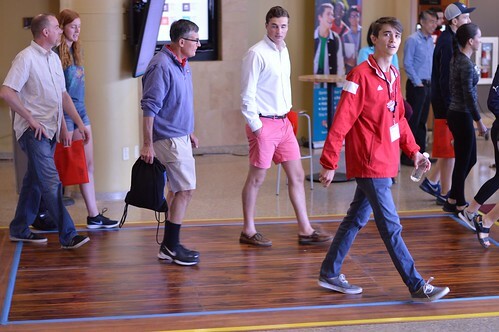 As thousands of visitors each day walk across a new flooring installation in UW–Madison’s Union South this fall, they might not realize they’re participating in what could very well represent a leap into the future of renewable energy production. Pallet Enterprise, the leading pallet and sawmill magazine in America, recently talked with World Neih, national program leader for Forest Products and Wood Utilization for the U.S. Forest Service in Washington, D.C. The recently published article follows a question-and-answer format, and Neih describes the latest developments in wood technology and product development, and how these innovations develop new markets for wood. Many of the developments Neih refers to, from nanocellulose to cross-laminated timber, are advancing thanks to research here at the Forest Products Laboratory. The future of wood products presents countless opportunities, and we’re proud to help lead the way.